It seems counterintuitive, right? Rip out eight lanes of freeway through the middle of your metropolis and you’ll be rewarded with not only less traffic, but safer, more efficient cities? But it’s true, and it’s happening in places all over the world. Many freeway systems were overbuilt in an auto-obsessed era. It was decades later that cities realized they were actually healthier, greener, and safer without them. Like cap parks, which hope to bridge the chasms through severed communities—Boston’s Big Dig is a great example—removal projects create multifunctional streets that can be utilized by all modes of transit and reconnect neighborhoods that were devastated by highways. In fact, this is why the US Department of Transportation recently introduced an initiative that focuses on repairing the inequality that urban freeways institutionalized so many years ago. Okay, you’re thinking, but where do all the cars go? It turns out that when you take out a high-occupancy freeway it doesn’t turn the surface streets into the equivalent of the Autobahn. A theory called “induced demand” proves that if you make streets bigger, more people will use them. When you make them smaller, drivers discover and use other routes, and traffic turns out to be about the same. Don’t believe it? 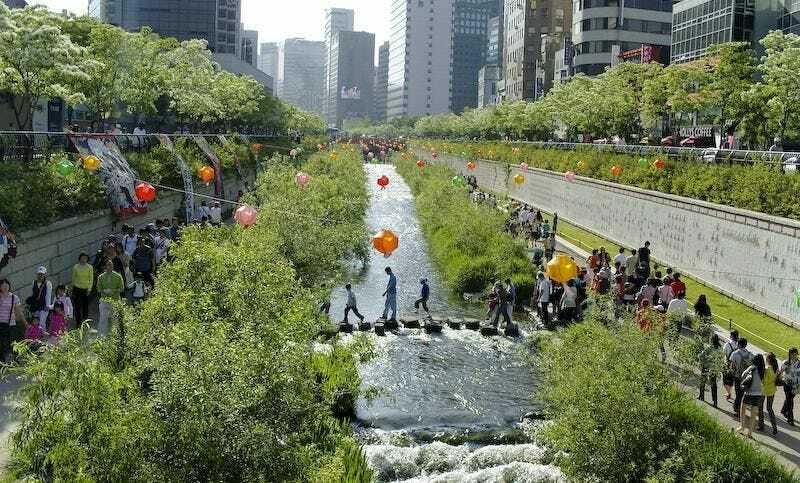 Check out these freeway removals in cities all over the world and see for yourself. Looking at San Francisco now, it’s hard to believe that a massive, stacked freeway ran right along what is now one of the most scenic views of the bay. But there it was, State Route 480, until the 1989 Loma Prieta quake damaged it. There had been talk about removing the freeway since the early 1980s, but the earthquake spurred the conversation along, and demolition began in 1991. The result was a triumph for downtown San Francisco, which now had miles of public space, walking and bike paths, plus new transit routes where the double-decker freeway once was. The city also helped prove to the rest of the world that freeway removal was not only possible but could be an economic boon for the city, since San Francisco both saved money on construction—installing the wide boulevard was cheaper than fixing the freeway—and the new development increased property values. San Francisco actually got two great removal projects out of this earthquake: The city’s damaged Central Freeway also became Octavia Boulevard. One of the most transformative freeway removal projects not only tore out a dirty highway from a city center, it actually daylighted a lost waterway. An elevated highway had been built through Seoul in 1976 as a way to boost economic prospects in a low-lying area which had become a slum. In 2003, the city’s mayor proposed to remove the freeway and and turn the site into green space, which also required naturalizing the creek that once ran there. Not only has the greenway become a well-loved part of the city, it has proven to benefit the city in many different ways. The temperature of the inner city has dropped several degrees, and birds, fish and other wildlife have returned to the urban core. Also, since the freeways were removed, fewer people are driving into the city, choosing to take public transit or other options. They even left a few freeway pillars as reminders of what came before. In the 1950s, the six lanes of Route 99 ran along the Willamette River as a major thoroughfare, but as other freeways were built, it became less popular with drivers, who could get across the city faster using one of the newer roads. In 1968 Oregon’s governor proposed transforming the highway into open space, and the freeway was closed for good in 1974. The ensuing open space stretches along a long portion of the riverfront. Portland remains one of the best cities for river access thanks to this important decision. In addition to the several parks that were created, other aging buildings were also removed to allow for additional public space, and the revitalized river also helped to spur development in the now very popular industrial areas just to the west of the banks. The downtown area of Milwaukee was supposed to be completely surrounded by a freeway, and construction had even started in the 1960s, when opposition began to mount, halting part of the project from being built. Luckily, a few decades later, the city began development of its Riverwalk project, and realized the benefits of having open access from the downtown area to the river. The Park East Freeway was seen as a barrier to increased development and was demolished starting in 2002. McKinley Avenue replaced the freeway, and renewal plans began to lure new tenants to the area and connect it to the Riverwalk development. Property values have gone up and the area is now a desirable place for people and companies, although some say the increased interest in the area took longer than expected. Like many urban rivers, Madrid’s Manzanares River was an important part of the city’s history, but had been completely neglected after two large spans of the M-30 freeway took over its banks. A plan to revitalize the river was set in motion in the early 2000s and opened to the public in 2011. Traffic was rerouted through several underground tunnels, and the land adjacent to the river was completely redeveloped into a 300-acre park that includes running and biking trails, skate parks, recreation centers, 17 (!) playgrounds, and even an urban beach. The impact of the Rio Madrid project has been astounding for the city, with studies proving that residents who live close to the park and access it frequently are becoming healthier. Up in Seattle there’s another removal project that was launched into action by an earthquake. The Alaskan Way Viaduct in downtown Seattle was damaged in the 2001 quake and needed to be completely rebuilt to new seismic standards. So engineers decided to take the road itself underground, and they’re building a smaller, two-mile, four-lane tunnel through which to reroute cars. In addition to tucking cars below grade, the project will create a connections between the local neighborhoods and the waterfront, bringing public space and pedestrian walkways to these residents. The project should be completed next year, but it has already been delayed due to the misadventures of the world’s largest and most famous tunnel boring machine (TBM), Bertha. One city hoping to jump on the freeway removal bandwagon is Dallas, where a hunk of Interstate 345 separates downtown from the popular Deep Ellum neighborhood. It’s still early in the game, but the Texas Department of Transportation agreed to study the project, even though it’s already planning a $100 million renovation of the freeway. A group named A New Dallas is leading the cause, hoping to reclaim the freeway land for real estate opportunities, pedestrian connections and parks. Dallas already did an excellent job capping a freeway for a park. This story was originally published on March 26, 2014. It has been updated to include the USDOT’s new initiative to fix urban freeways.